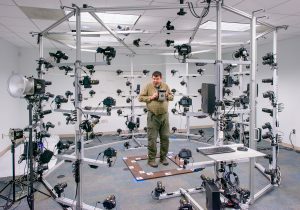 In 2015 UMBC received a Major Research Instrumentation (MRI) award from the National Science Foundation (NSF) to commission a photogrammetry 3D and motion capture scanning rig that can support faculty research in multiple disciplines. Direct Dimensions a Baltimore based company and world leader in 3D scanning technologies, was commissioned to build one of the first commercially produced photogrammetry scanners. The 90 camera rig and appropriate control and processing software was installed in December, 2015. Since then we have added four additional cameras, to a total of 94. As a test subject, Chris Peregoy, Visual Arts, along with his antique camera, is being 3D scanned in the newly installed 90 digital camera rig. The scanning facilities are housed within UMBC’s Imaging Research Center’s facilities. Currently the rig can accurately scan objects from as large as a cow or motorcycle, down to something as small as a grapefruit. One of the most important features of photogrammetry is that the scanning records the surface colors as well as the shape. Having multiple cameras synced with electronic flash allows the scanning of living objects or objects in motion. The rig can also capture bursts of 10 frames which offers the ability to study motion – for example studying how someone sits down into a wheel chair. Additional proposed research by UMBC faculty is program it to record 3D video as well as using polarized light to gather additional spectral and transparency surface information. Checkout the finished and prepped model of the ribbon cutting ceremony. This scan was completed just as the ribbon as cut. Use you mouse to rotate around Direct Dimensions CEO Michael Rapheal and UMBC President Freeman Hrabowski. Thanks to everyone at Direct Dimensions for building the rig and creating this scan. You can see a photo of the ribbon cutting in the UMBC News story on the facility opening. Additional press in Technical.ly Baltimore and The Daily Record.